Mystic, humanist, philosopher, Saint Haci Bektas Veli, the founder of the influential Bektasi sect of dervishes and the leader of an Islamic philosophy and social class in the 13th century. He had great impact on Anatolian humanism. His teachings become know as Bektasism. Haci Bektas Veli was the one who dedicated himself to the people, the rural society, thus serving as a promoter of Turkish language and literature. 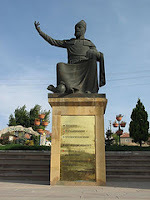 During the 3 days festival from 16th to 18th of August, he is recalled at his hometown Hacibektas.